When Stephen Fry laments “it is a cause of some upset that more Anglophiles don’t enjoy language,” it’s as if Michael Phelps were to lament that not enough people enjoy water. 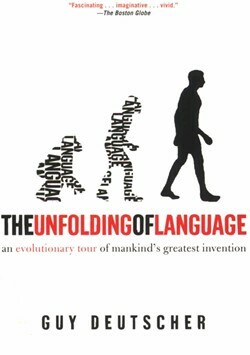 So when Stephen wholeheartedly recommended Guy Deutscher’s The Unfolding of Language, which he characterized as more playful and engaging than books on similar subject matter, I was hard pressed to say no. It’s taken me ages to find time to get into the meat of this book (strictly my own fault), but now, about two-thirds of the way through, I wanted to offer it my wholehearted recommendation for anyone who is even remotely interested in language and its origins and evolution. Deutscher’s prose is indeed playful and accessible, his examples thought-provoking, and his subject matter fascinating: what are the forces that shape and transform language? Deutscher mentions more than once that “These days, there are no systems of communication which are in the process of evolving their first words.” He’s right, I suppose, but only on a technicality. Last week I was taught the basics of a computer scripting language I’d never worked with before. Surely the constructs of some arbitrary scripting language represent one of many “artificial” systems of communication which are in the process of evolving their first “words” (and tokens). I am writing this now as Deutscher transitions in the book from talking about the destructive forces which are applied to language (which favor economy, expressiveness, and analogy), into the constructive ones which enable new linguistic richness to blossom. Metaphor, apparently, provides many of the raw materials for new grammatical elements. With that observation under my belt, and aspiring to be a creative force in the universe, I suddenly feel a bit better about my obsession with admiration of Roger’s Profanisaurus (a dictionary of profanity that originates in the pages of the UK’s Viz magazine, which derives cleverness and vulgarity in equal measure from a playful, multi-layered cocktail of metaphor, rhyming slang and other wordplay). oirish kitteh tinks: deres a flavr on meh, so dere iz. Back to Deutscher’s book. He spends the fifth chapter illustrating a point by employing a fictional dialogue between a cast of characters at a ‘George Orwell Centennary Conference’. it’s a technique akin to the one I admired in Hofstadter’s Godel, Escher, Bach. Actually, that’s all I have to say. Check it out. Go for a swim. And apologies to Deutscher, Mellie, Fry for this rambling but heartfelt review.